I've got major spring fever y'all! It's been in the 70s here in Charleston, so it is basically spring here already! Target has such cute spring clothes out right now, and I'm so happy to finally be able to share this dress! 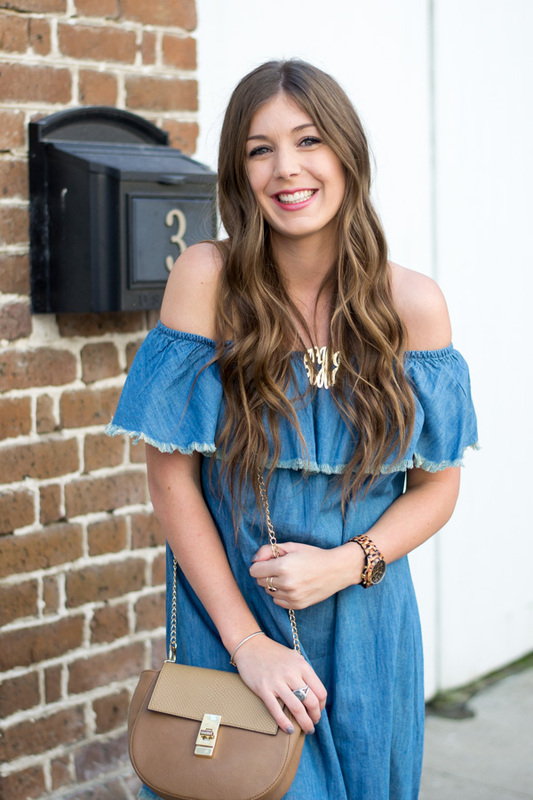 Off-shoulder chambray is one of my favorite trends (I wore this dress last summer), and I Loved the distressed hem on this one! 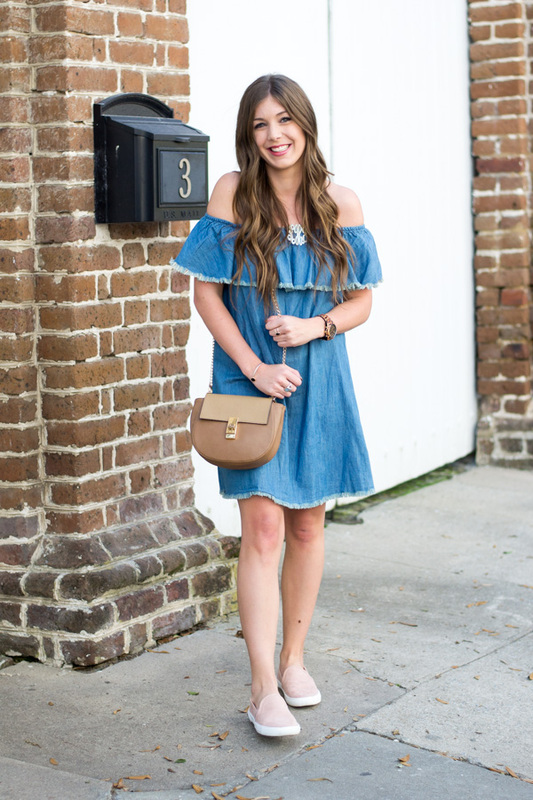 Speaking of Target and my love for their clothing, this week I am teaming up with an amazing group of ladies to bring you an INCREDIBLE giveaway. One lucky reader will win a $1,000 gift card to Target. You look gorgeous giving me spring fever!!!! such a cute dress and those sneakers are adorable! 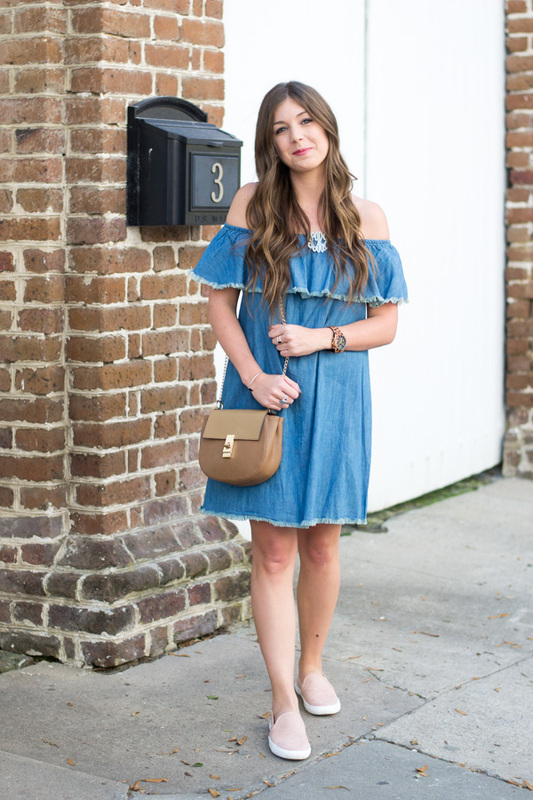 Love the OTS dress and the shoes you paired with it!! & Great giveaway! This is my kind of Spring outfit! 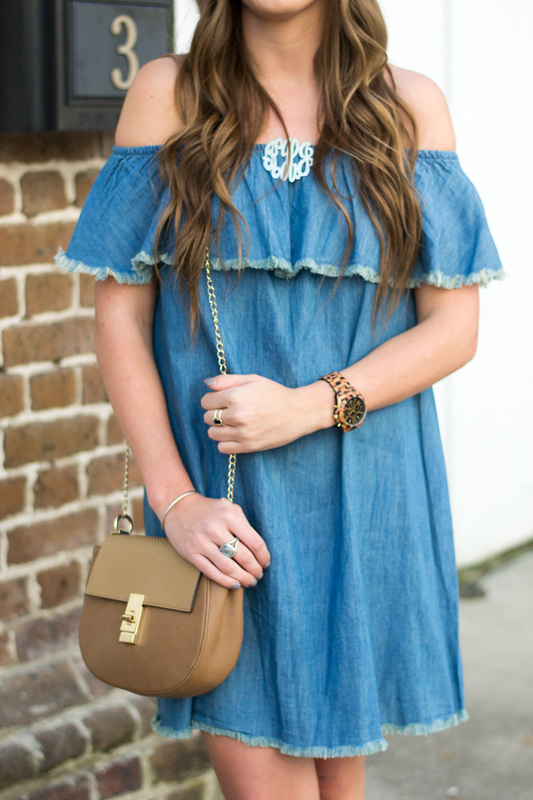 I love denim dresses! And I wear my pink slip ons all the time! Such a cute dress. I am really loving these shoes too! You look adorable in this dress! I love your shoes too. So jealous of your weather! It's still freezing in England but that's nothing new. Love the shoes! That dress is adorable!! 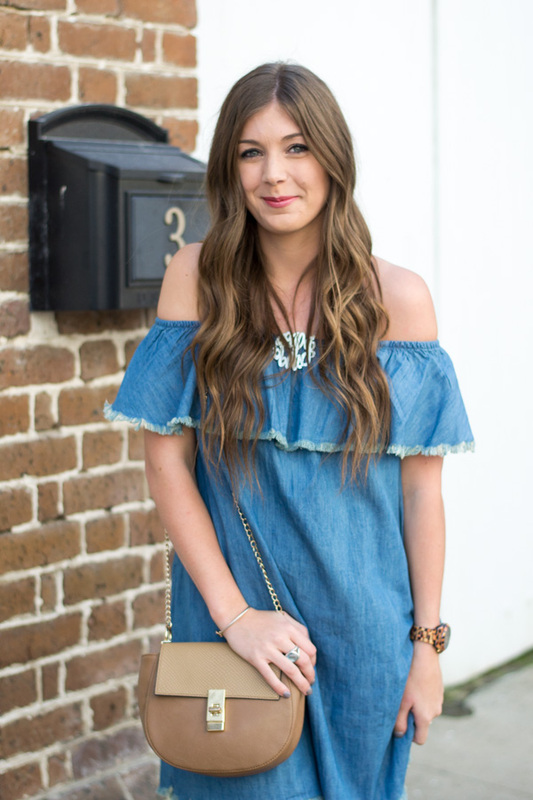 I love the off the shoulder look, and especially that it's from Target. That place is my JAM. Love love love your outfits, girl. This dress is so cute! Target has been killing it lately with their clothes! That WhoWhatWear line is so amazing that they have there as well. My coworker actually came in wearing this dress the other day to work and got so many compliments on it. Such a cute look! Woah what an awesome giveaway - thanks so much to all of you for hosting!! I love your dress, I'm so happy that off-the-shoulder is staying in style this spring. I just love that look! That dress is too cute! I like the shoes too! I also entered the giveaway! I am going to make sure to share. I am loving those slip on sneakers! And that dress..I love! This is the cutest dress! I love how you paired it with those pink shoes! 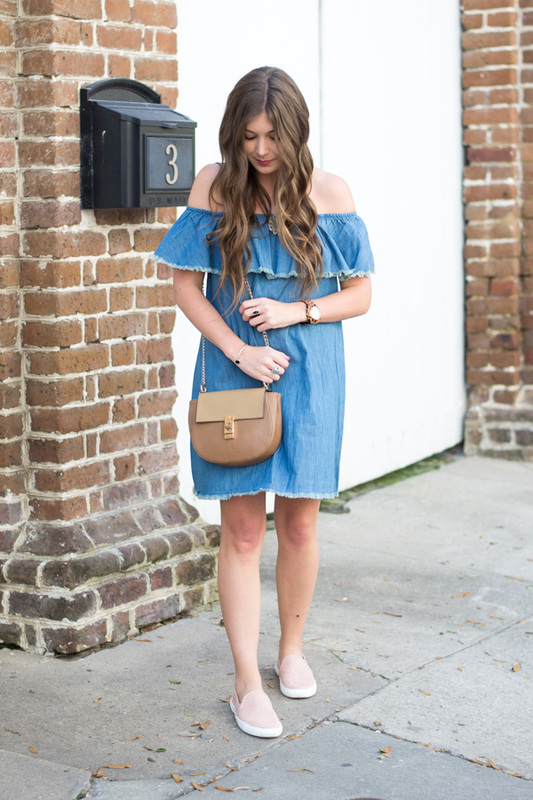 I love denim dresses and just realized I don't have one! How is this possible. This needs to change immediately. I need that dress in my life! Love that dress and those shoes are too cute! LOVE this look! You wear it beautifully! I am in LOVE with that dress! It is in my cart right now on the Target website I just have not decided if I really need it right now or not lol. You created a really cute look with it! Loooove your hair! And of course this dress! Adore this dress - so cute!